Safe Simple and Space Saving Clothes Drying Systems: No More Procrastination! A Nifty Solution For Drying Heavy Laundry Is Here! No More Procrastination! A Nifty Solution For Drying Heavy Laundry Is Here! How often do we wash our heavy clothes – blankets, quilts, bedcovers or curtains? How many of us procrastinate – continuously putting off the heavy laundry day? Well, Rachna was no different. A 35-year-old schoolteacher with a bouncy 12-year-old son, a very busy husband, and erratic domestic help, Rachna’s routine was hectic to say the least! Despite being an energetic and efficient multi-tasker, she was left exhausted juggling between her son’s school projects, managing her own schoolwork and doing the household chores. Though she found quick fixes for many household tasks, one of the most daunting chores remained doing the heavy laundry. 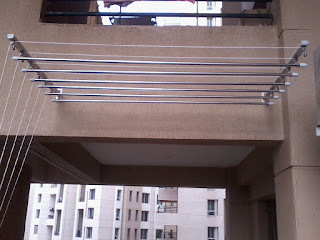 The very thought of having to lift a load of damp, heavy blankets or bedcovers, heaving them out into the balcony and then up onto the clotheslines while standing on a chair, would cause tired Rachna to quail and to keep postponing the day. At the same time, she knew that she was inviting bacteria and sickness by leaving these items unwashed for so long. Caught in this difficult situation, Rachna took to surfing the web, desperately looking for the solution to her problem. And thanks to the web, she got her answer! Rachna was intrigued to find a website called Ecospace Clotheslines and was particularly interested in the Cantilever Bracket Mount Pulley Operated Clotheslines. Placing her trust and hope in the company, she purchased a nifty family size set of 6 clotheslines. And boy, what a change! Today Rachna avidly washes her heavy blankets and curtains without hesitation and with a merry tune on her lips! 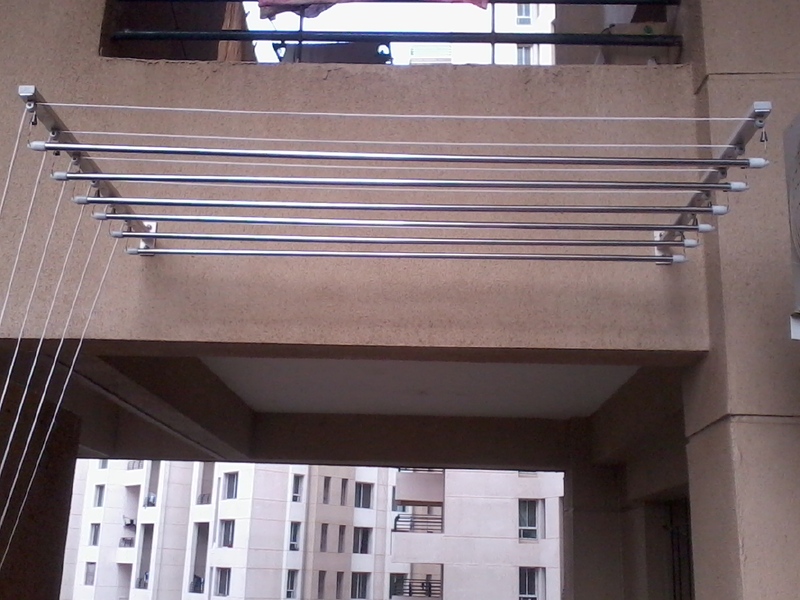 These convenient clotheslines can be installed on a vertical wall in open or alternate terrace balcony, thus freeing floor space and, in Rachna’s case, balcony space. Lightweight aluminium cantilever brackets give a heavy-duty performance, supporting clotheslines ranging between 3 to 9 feet that can each bear up to a phenomenal 10-12kg of weight! The clotheslines consist of stainless steel pipes, which means they neither rust nor sag and look elegant as well! Each clothesline of this space-saving device is raised and lowered by means of strong marine-grade nylon rope that is smoothly operated via nylon pulleys. Big house or small, you can customize your Cantilever Bracket Mount Pulley Operated Clotheslines according to your need with a minimum of 2 clotheslines and a maximum of 6 clotheslines. Rachna has installed her clotheslines near her washing machine. She lowers the clotheslines and easily transfers the washed heavy laundry from the machine straight onto the clotheslines. It is so easy that even her son hangs out the heavy laundry at times! There is no chance of odour since there is ample space between the pipes for optimal drying. Furthermore, it is much safer for Rachna since there is no need to climb on to a chair! Rachna bought the family size 9ft long clotheslines that easily dry a full load of blankets, bedcovers or curtains. So which size are you buying today?